Last week my friend and mission trip leader for the August 2015 ACT trip Shelly Wilson posted a blog titled "Why I'm Going Back." 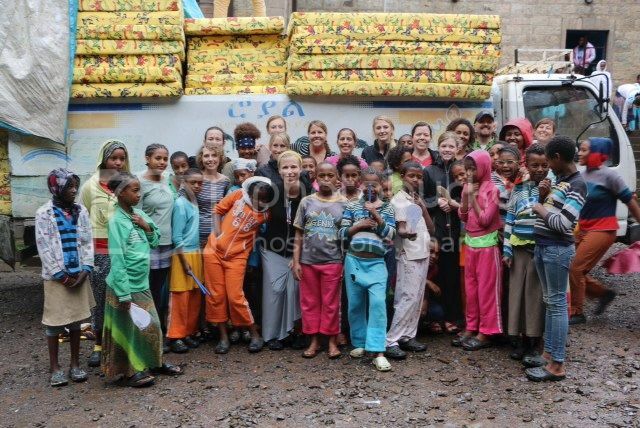 She explained all the reasons why she felt that God wanted her to go on another mission trip to Ethiopia this summer, even though she, her husband, and her daughter had gone to Ethiopia last summer. It was great blog post, and you should totally read it. This weekend I filled out my application to be on her mission team in August. One of the questions was "Describe why you want to visit the orphans?" and I answered, "I can't imagine not going back." There are two reason I feel going back isn't even an option for me. One is that my future son is only a drop in the bucket of the orphan crisis. I've heard this phrase a lot when I tell people that we are on the list to adopt from Ethiopia. "You are going to change that kid's whole future." It's true, and I get goosebumps thinking about what God (not I) am doing in our son's life. But the fact is that their are millions of orphans in the world that will never get the chance to be adopted. If you go with the most conservative number, 17.8 million children have lost both their mother and father. The amount of children that have been adopted in the last decade through international adoption is around 178,000 adoptions. If you make that into a ratio, it means that less than 1% of those orphans are adopted into a family. More than 99% of the world's orphans will never be adopted. Knowing that fact, I can't help but do all the big and little things God sets before me to care for orphans that will never be adopted. Honestly, I saw needs in the orphanages that were not being met. I will continue to try to help meet those needs until I hear an audible voice of God telling me to stop. It is clear to me from God's word that continuing to try to meet the needs of those parentless children is what we as Christians are suppose to be doing. The second reason I can't imagine not going back is the book of Acts. If you haven't got out your Bible and read through Acts lately, do it. Do it, and ask yourself it the early church reminds you of your body of believers. Most likely you will see some things you and your church are getting right, but you will also be convicted of some things your church is missing the mark on. Specifically Acts 4:32-37 where it describes the early church sharing their earthy possessions until "there was not a needy person among them" has really opened some serious debate in my head and made my heart so sensitive to the needs of other believers. On our trip we met the most beautiful, sweet, Christian family. This family was only a mom and her son, Samuel. They were both HIV+ and living in a 100 square feet home of corrugated metal and cardboard. Knowing that this family and I were part of the same Bride of Christ broke my heart in a way that I cannot explain. This woman was dealing with a serious illness, depression, raising a teenage son with a serious illness, and she was doing it all with less earthly possessions than my 4 year old. I knew God was taking care of her, and I knew the hope of Jesus was more real to her than most Christians. But now that I had meet this family, these believers in His church, I knew I was responsible to now live my life like I knew about them, no longer in ignorance of their existence. Faces are covered out of respect for privacy. If there is anything I can do to encourage my brothers and sisters in Christ in Ethiopia, I feel I have the responsibility to do it. Visiting them is encouragement. Praying for them is encouragement. Giving is encouragement. Our mission trip in August will allow me to do all three of these things. Now that I've told you why I can't imagine not going back to Ethiopia again this August, think about if you can image going. We have 6 people who have signed up for this trip, and I know God has a few more He is calling to go along with us. Let me know if that might be you. I hope I can be the kind of friend you call when the rice is running thin.